What can I say? I am a pet bird lover! Cinnamon, Lillian, Pepper, Sassafras, Hannibal and Luna. Cinnamon is a fawn-colored cinnamon variety cockatiel, born in September of 2001. He can say "kissy" and "good morning." 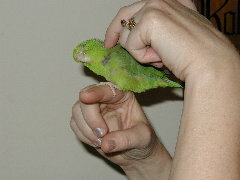 Lillian or "Lilli" as we often call her, is a charming green Parrotlet. She was born probably in early 1998. She is very affectionate and loves to be held close to our chest which makes her "purr." She had a lot of health problems as a baby and we adopted her in September of 2002. We also call her "little Miss Fussbudget" because she's very excitable, as well as "little green monster,"
because when her temper is riled, she will attack anything that comes near her...even an ostrich!. 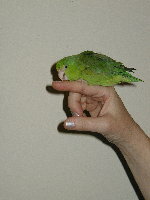 Pepper is a peach-faced lovebird, probably born around January of 2002. He's very good natured but somewhat neurotic and plucks his own feathers. He is not very tame, and he is madly in love with Miss Lillian. Pepper and Lillian have become inseparable, though they hated each other at first!. They snuggle up in their cage together and preen each other affectionately! 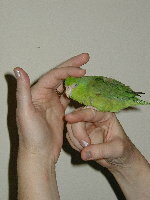 Sassafras ("Sassy" for short) is a Jenday Conure and a "rescued" bird. That is, he was found wandering around outside in somebody's yard, age unknown. The homeowner took him in, fed and cared for him. 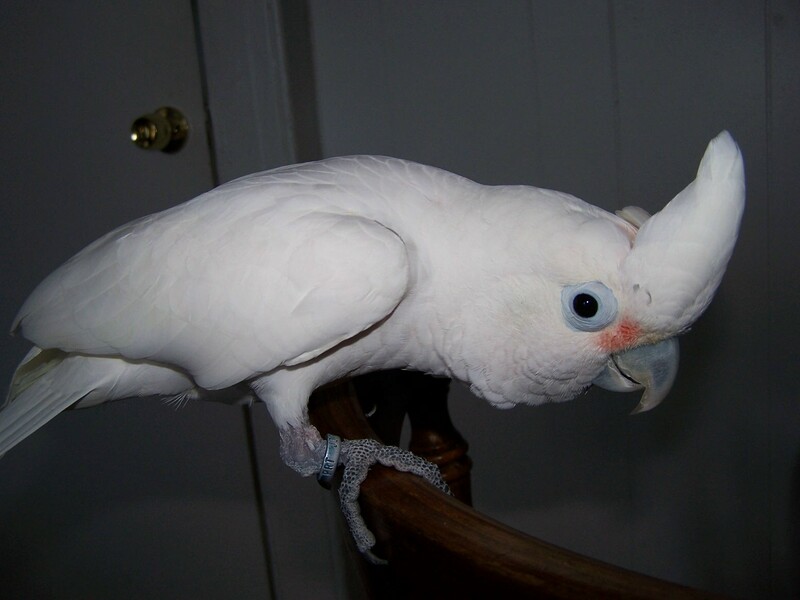 Then the bird rescue coordinator was called and Sassy was adopted out to me! He is mostly affectionate and quiet, but squawks loudly when he needs to complain! He is very territorial and will "dive-bomb" any visitor who is not part of the flock. Hannibal is a Severe Macaw and another "adopted" bird, born about 1995. He spent some of his life living in a sports bar next to a baseball field. He has quite the vocabulary and loves to swing a french-fry like a bat! Hannibal can be moody and nippy but also very sociable and charming. He thinks he is "king of the jungle" and sometimes can squawk very loudly. He loves his morning toast and screams when he smells it being prepared. 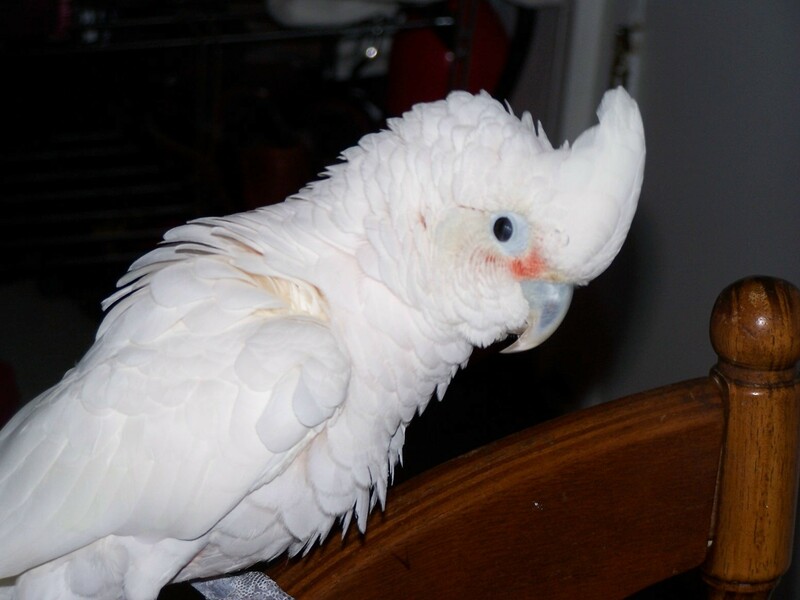 Luna is a Goffin's cockatoo that we are fostering. Her call sounds like a "steam whistle" going off. She won't go to bed until everyone in the house has said "goodnight" to her. teasing them, unfastening their toys, and generally showing off. died in an unfortunate accident where he was crushed to death. Fortunately, he only lasted about 15 seconds, so his death was quick. We buried him in our backyard. His best buddy, Cinnamon, was devastated. He was our very first bird and we will miss him terribly! As you can see from his photo, he had an engaging personality.